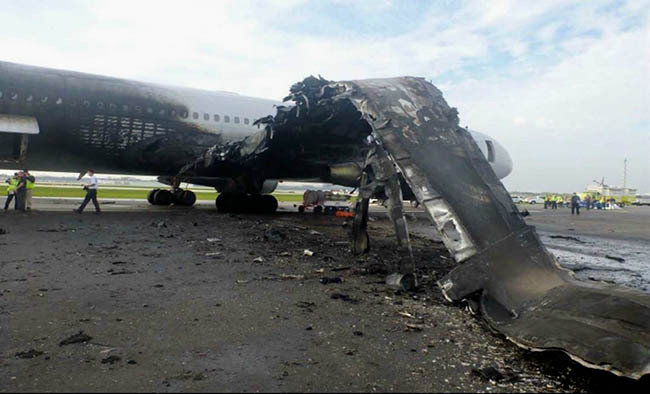 Aviation may have come close to having a disaster on October 26, 2016, when an American Airlines Boeing 767-323 experienced an uncontained engine failure and fire during its takeoff roll at Chicago O'Hare International Airport. There were 170 souls on board: 161 passengers, seven flight attendants and two flight crewmembers. A flight attendant and 19 passengers received minor injuries. While some will say there’s really nothing to see here because the system worked the way it was supposed to and no lives were lost, I’d suggest that were it not for some judicious human improvisation and a generous supply of luck, the outcome would have been very different. Flight 383 was en route to Miami International Airport in Florida. As you’d expect for a Part 121 flight, it was operating on an IFR flight plan. The weather at the time was VFR with scattered clouds at 2,000 feet AGL, a 25,000-foot overcast, visibility 10 miles, wind from 180 degrees at 11 knots, temperature 16°C, dew point 11°C, and an altimeter setting of 30.04. In all respects, it looked like a routine day when the flight crew reported for duty at O’Hare at about 1:20 p.m. The plan was for them to handle the flight to Miami, then do a return trip to O’Hare. The captain and first officer had flown together before; in fact, the previous day they did a Miami to O’Hare trip together. The captain, age 61, had about 17,400 total flight hours with about 4,000 hours on Boeing 767 airplanes. His 767 pilot-in-command time was 1,500 hours. He held an ATP certificate and a current first-class medical certificate. The first officer, age 57, had about 22,000 flight hours. He had about 1,600 hours in the 767. He held an ATP certificate and a current first-class FAA medical. Both pilots were type rated in Boeing 757 and 767 airplanes. This particular Boeing 767 had 50,632 flight hours and 8,120 flight cycles. The right engine had 68,785 total hours in service and 10,984 total cycles. The left engine had 46,822 total hours and 7,299 cycles. A cycle is one takeoff and landing. The captain handled the airplane during the taxi for an intersection departure on Runway 28R at taxiway N5. They had 9,750 feet of the 13,000-feet-long by 150-feet-wide runway available. According to the NTSB’s transcript of communications from the cockpit voice recorder (CVR) and FAA recordings, at 2:30:29, the tower local controller radioed, “American three eighty three heavy runway two eight right at november five, line up and wait. Winds two zero zero at one four.” The first officer acknowledged. Just after 2:31:43, the flight data recorder (FDR) showed the airplane was at 128 knots when there was a sudden change in G forces consistent with an airframe vibration caused by a sudden engine imbalance. The CVR picked up a bang and the captain said, “Whoa.” They didn’t know it, but the high-pressure turbine stage 2 disk in the right engine had ruptured into two large pieces, which flew out from the engine. One tore through the right wing and struck the main engine fuel feed line, then cut into the fuel tank and shot up and over the fuselage. It flew to the roof of a United Parcel Service warehouse 2,935 feet away, where it chopped through the roof and landed on the warehouse’s floor. Imagine the force it took to catapult the 56.6-pound disk fragment on that journey. The other chunk of the disk slammed into the runway and fractured into three pieces. The captain initiated the rejected takeoff maneuver. On the CVR, there was a sound similar to the throttles hitting the idle stops followed by the sound of engine rpm dropping. The autobrakes were put into the rejected takeoff position. The airplane had reached 134 knots, which was the calculated V1 speed—the “go or no-go” decision speed. Just a few seconds would have meant that the flight crew was facing a situation far more perilous than the one with which they were now dealing. According to the FDR, the airplane finally came to a complete stop 26.4 seconds after the engine failure. The captain subsequently told investigators that he could smell smoke as soon as it stopped. Because the wind was blowing the smoke away from the cockpit window area, the pilots could not immediately tell the seriousness of the blaze. At about 2:32:18, the controller asked if the crew could provide any information and the first officer said to stand by. Twenty-one emergency vehicles with 56 first responders on board were on the way. At 2:32:41, the CVR picked up the captain saying, “Oh, look at the smoke—check out the smoke.” Within four seconds, he had stopped running the engine fire checklist and called for the evacuation checklist. The evacuation checklist had nine steps. The third step was to depressurize the airplane and the fourth step was to cut off the fuel switches to shut down the engines. The left engine kept running for a minute after the airplane had come to a stop. The captain later told investigators that the delay in shutting it down was because depressurization took a long time and they had to wait before moving to the fifth checklist step. The NTSB noted that the airplane had not been in the air and the differential between cabin pressure and ambient pressure was very little. The captain said that while they were running the evacuation checklist, he could hear a commotion outside the cockpit door and realized that the flight attendants had already ordered an evacuation. What he couldn’t know at the time was that the situation in the cabin had been getting chaotic as passengers started acting on their own, were refusing to obey flight attendants, flames were billowing up outside, smoke was pouring into the cabin, and flight attendants had been unable to contact the pilots for instructions. The flight attendant in the 2R jumpseat told investigators she heard a loud boom, which she thought was a blown tire, but a half-second later heard a loud explosion and saw fire. Some windows were blackened and looked shattered, and she saw an orange fireball in the main cabin on the right side. Passengers jumped out of their seats even though the airplane was still moving, and she shouted, “Remain seated, remain seated, heads down, heads down.” She said passengers started coming toward her. When the airplane stopped, they began pushing her and asking, “Where do we go?” She knew her exit was unusable because of the fire outside. Checking first class, she could see the exits were open there. She redirected the passengers to the front of the plane. She could see that some had opened the overhead bins and were blocking the aisles trying to get their bags down. She told them repeatedly, “Don’t take anything with you.” A male passenger refused to listen and pushed toward the exit while holding his bag over his head. One passenger was blocking a slide and had her bag with her. “You’ve got to get out of here,” the flight attendant shouted. Two flight attendants reported that the 4L door slide could not immediately be used because it had been blown aft by the exhaust from the left engine, which still was running. The slide did remain attached to the airplane. A male passenger told NTSB investigators that he was seated in an exit row, and the woman assigned to the window seat froze. He said he reached past her to release the overwing exit hatch. He said he got out and sat down on the slide and started down. He said no one was at the bottom of the slide to help him, and he tumbled off. He said he stood up to get away, but the thrust from the left engine, which still was running, blew him over. One flight attendant tried to use the interphone to call the flight deck and tell the pilots that the left engine was still running but pressed the wrong numbers on the phone. Another flight attendant tried to use the interphone system to make a public address announcement to the passengers but couldn’t remember how to use it. A third flight attendant also reported having difficulty using the interphone system. The NTSB found that American Airlines used 13 different interphone systems in its fleet, and said its training of flight attendants in how to use them was inadequate. Even the airline’s Boeing 767s don’t all use the same interphone system. The NTSB used videos made by passengers showing what was happening on the left side of the airplane to create an approximate time line of the evacuation. The left overwing exit appeared to have been opened 15 seconds after the airplane came to a stop, the slide deployed 4 seconds later, and the first passenger was down the slide by the 31-second mark. At the 46-second mark, the 4L slide deployed but was blown aft by the left engine exhaust. It took 23 seconds for that slide to straighten itself out and become usable. When the pilots got out of the cockpit and entered the forward cabin, it was filled with smoke, and the captain couldn’t do a required walkthrough to be sure everyone was off. They were immediately met by the lead flight attendant, who told them that all passengers were off the airplane and that they needed to get out, which they did using the 1L door and slide. It was 2 minutes and 21 seconds after the airplane came to a stop that the video evidence showed the last person sliding to the ground using the 1L slide. After an evacuation, the flight crew is supposed to assemble passengers away from the airplane with the captain making sure at least one crewmember stays with the passengers. The NTSB said that according to interviews, this was not done and the flight attendants failed to do a required head count to make sure all passengers were, indeed, off. It characterized the flight attendant coordination after the evacuation as not being optimal. As I noted, the right engine had 10,984 total cycles. The stage 2 disk that failed has a life limit of 15,000 cycles. The disk had 4,016 cycles to go at the time of the accident. It had been subjected to all required inspections during its time in service. When the disk fragments were studied, multiple low-cycle fatigue cracks were detected. Also detected were microscopic-sized oxide particles forming what the Safety Board called a “discrete dirty white spot.” The investigators said this manufacturing anomaly likely could not be detectable during production and in-service inspections using current inspection procedures. However, the NTSB also determined that the fatigue cracks that developed should have been detectable during the disk’s last inspection because they had grown big enough by that time to show up using ultrasonic inspection techniques. In addition to the high-pressure turbine disk failure being the primary item in its probable cause, the NTSB said factors included the delay in shutting down the left engine, a flight attendant allowing the left overwing exit to be used while the left engine was still running, the lack of a specific checklist for engine fires on the ground and the lack of communication between the pilots and flight attendants after the airplane came to a stop. The NTSB issued nine new safety recommendations as a result of this accident, ranging from reviewing fuel tank design to drafting new checklists for on-ground engine fires and making changes to training in the operation of interphone systems. While the Safety Board did call for research into the effects carry-on baggage has on getting people out of airplanes during an emergency evacuation, I think it missed something really important: finding methods to ensure safety consciousness and discipline on the part of the greater numbers of passengers being squeezed into today’s airliners.